Recently concern has risen over a pending low in unemployment data among other signs of a major stock market and economic top. While a bit presumptuous to assume unemployment can’t go much lower, it’s of course a given that when the economy peaks and heads toward a recession, unemployment will have bottomed and begin to head North. Past low water marks have range from 2.5 to 5%. Given that we have a record level of unfilled jobs, record concern over labor quality, record percent of small businesses increasing wages and planning to add labor, could it be that unemployment will fall well beneath the current 3.9% rate in 2019? The NFIB Small Business surveys had consistently been in a recession mentality for over 8 years until the last Presidential election. The month of the 2016 election Small Business Optimism soared at an historic pace typical of a brand new booming economic recovery. A new Bull market cycle in stocks also kicked into high gear upon Trump’s arrival predicated upon the promise of strong pro-business policies. NFIB Small Business Optimism is now testing its all-time high of 1983 and history indicates that business sentiment peaks years before the economy begins to roll over into a recession. In fact, 2017’s optimism surge supports our interpretation that after the global energy recession ended in 2016, a new 4 to 5 year economic expansion cycle commenced and that we are currently working through the middle innings as of 2018. Not only are businesses experiencing record earnings, major labor shortages and extreme supply logistic delays, they also continue to feel that 2018 is the best time to add capacity in the history of this 44 year survey. Similar to the optimism, employment and earnings surveys, this urgent desire to grow their business to meet demand always climaxes years prior to an economic or stock Bull market top. Exogenous events can certainly negate historical precedent and brief stock market panics of 20% can occur at any time for no economic reason – such as in 2011, but its instructive to highlight that current conditions are not associated with the high-risk portion of an expansion cycle. 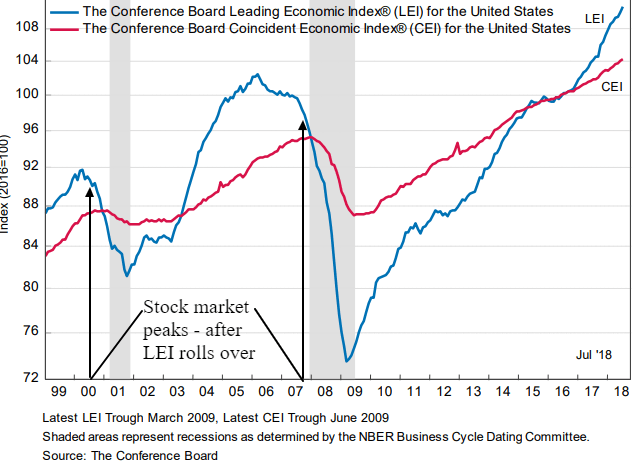 The Leading Economic Indicators (LEI) are really a nice measure of manufacturing, building, consumer sentiment, credit conditions and stock prices. Like the NFIB surveys above, the LEI typically rolls over before the stock market or economic cycle peaks. For the 3rd time since the great recession of 2008, we are well into a new rocket-ship move in the LEI that requires a few consecutive months of decline before we would raise the Yellow flag. To avoid Bullish complacency we constantly scour the data universe for signs of impending doom or even short-term panics. However, focusing on Margin Debt, Profit Margins, Valuations or Unemployment levels lack the context and oscillatory consistency to provide reliable indications of what lies ahead. This stock market has strong and expanding breadth, economic engines are firing on most of their cylinders, constrained mainly by labor shortages. Consumer sentiment, spending, income, and savings are very strong. The world is awash in record liquidity searching for growth. Longer-term risk in credit spreads, bank lending standards, default rates, LEI and other data correlations we often discuss have yet to appear. Short-term risks for investors can be more challenging to identify, but we remain on high alert whenever short-term sentiment extremes and momentum divergences appear.